This vintage wedding bus is a 1944 Bedford OWB model and has been totally restored to immaculate condition. 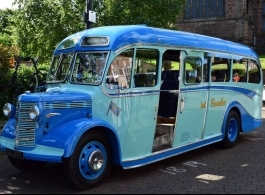 If you wish to hire a unique, vintage vehicle for your wedding then this 29 seat Bedford could be perfect for you. Please note: If you require more than one vintage bus then please see the other two under vehicle codes 0320 & 0368.